How can I make more money with my end forming expander or swager? OK, so you are fabricating with tube or pipe, maybe even have an established business or part of your business that brings in good income. But you could always do better with more jobs and more applications, right? We are getting a lot of calls about working with smaller OD tubing … 1 inch, 1 1/4 inch, even 1 3/8 inch. These are all types of fabrication applications… making heat exchangers, ag and irrigation applications, exhibit structures, even electrical conduit to name a few. We have small size arbors for our expander machines (for both the handheld 1685S and the bench top models) that allow you to work with the smaller expander tooling. For example, one sign fabricator saved $ tens of thousands by cutting his signposts in half, using a reducer to fashion a simple slip fit and cutting his UPS shipping bill dramatically. We work with many users on end forming larger size tubing and pipe. These include aerospace applications, HVAC and irrigation. Many of our customers don’t realize we have readily available 3 1/2 inch, 4 inch, 5 inch and even 6 inch expander tools that could help you tap into this huge and growing market. If you do automotive work, are you working on larger-than-3-inch exhaust systems? A larger size expander making large size expansions to connect large OD systems can be a huge profit generator. So how do you do it? 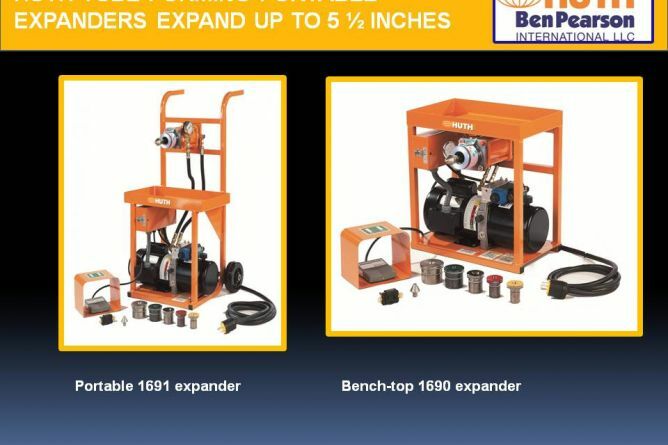 Well, you can buy the large diameter elbows from many fine sources, and then use the expander to create the connection to whatever size tubing you are working with. It is just that easy. Similarly, we have steam fitter customers adapting tube to fit pipe flanges to save a lot of money on pipe costs. Our 1673 expander-swager utilizes the same swage box that is on our benders. Using this is vital for reductions, and other end forming applications where it is necessary to clamp the tube or pipe. Flares and flanges are easy to accomplish in this way. You can achieve a slightly higher level of precision with your expansions by using a solid tool swage die to expand on a clamped pipe or tube. We often help users in fire suppression, plumbing, agriculture and structural frame fabrication with this type of work. We get a lot of calls for tooling to help with time-tested end forms and connections… ball joint segments, flare segments, header flange port shapes, etc. These are great ways to provide valuable services in the exhaust world. Placing bead forms in tubes are commonly used for many clamping applications, and have great potential in both automotive and non-automotive. And they are largely easy to accomplish with the right tooling. We would love to hear your killer profit ideas! Or, if you need a little help, please call us at 800-558-7808!